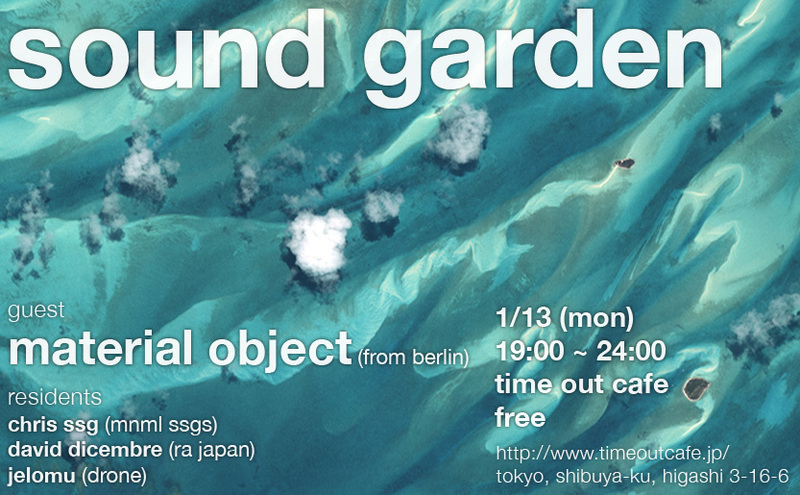 Our first Sound Garden of 2014 of the year is happening next Monday evening (it is a public holiday – Coming of Age day). We’ve got Material Object, who is visiting from Berlin, as our special guest. He was last in Japan in September 2013, when he played a special Pete Namlook tribute set at Labyrinth. There he demonstrated an amazing depth and knowledge of ambient music, which we look forward to experiencing again at Sound Garden. This is his only show in Japan for this trip, and an artist that perfectly fits with what Sound Garden is about, so we are really excited about this one. Please come down, relax and welcome in 2014 with us!